Here's something you probably didn't know about Visual Image Photography. Since 1992, we have donated our photographic services to the Vince Lombardi Charitable Funds, Inc. Over $14 million has been raised by the Lombardi since 1989 to support cancer research, patient education, physician education, new technology, cancer prevention, diagnosis, early detection and direct cancer care. The financial contributions raised help the Vince Lombardi Cancer Clinic at Aurora St. Luke's Medical Center. Right now, there are 13 clinics in eastern Wisconsin. You can go to www.lombardiclassic.com to learn more about this fantastic organization and how you can help support the work they are doing. 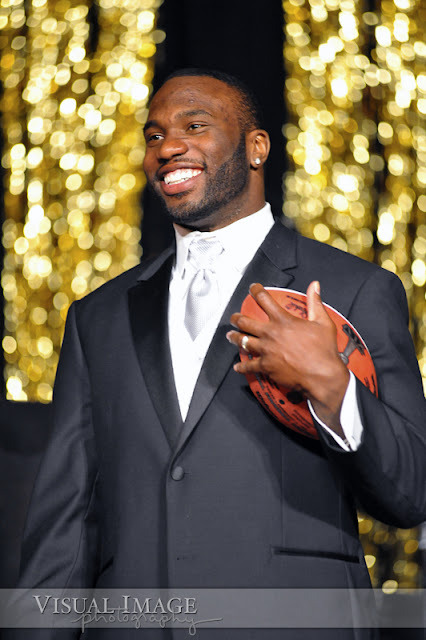 On March 5, the 2011 Vince Lombardi Award of Excellence Dinner Ball was held at the Pfister Hotel in downtown Milwaukee. 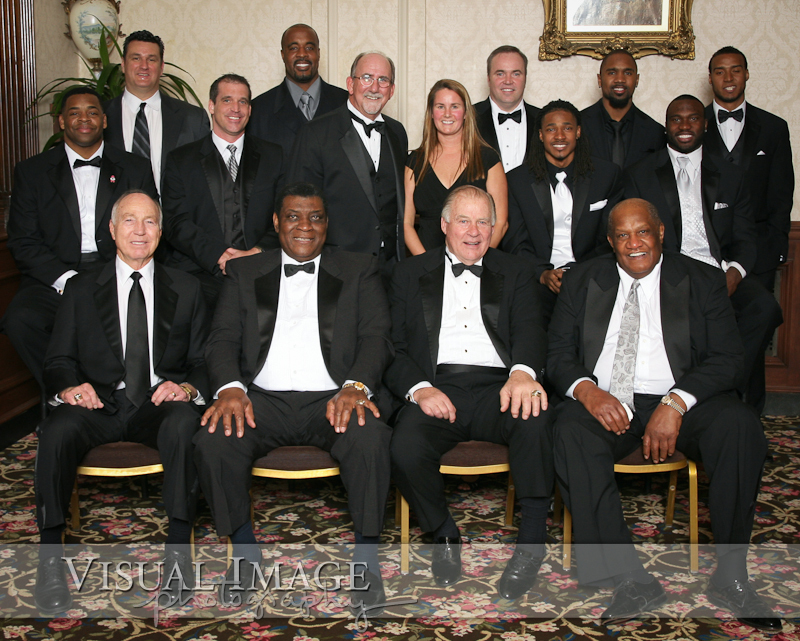 There were members from all four Super Bowl winning Green Bay Packer teams present at the dinner ball. Bottom Row (left to right): Bart Starr, Dave Robinson, Jerry Kramer, Willie Davis. Second Row (left to right): George Koonce, Chris Jacke, Tom Hayes, Courtney Lutz, Tramon Williams, Nick Collins. 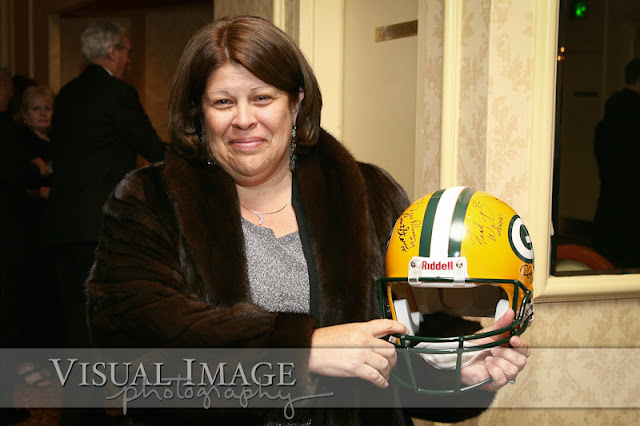 Yes, there are perks to donating our services to the Lombardi--like getting your picture taken while surrounded by so many amazing Packer players! 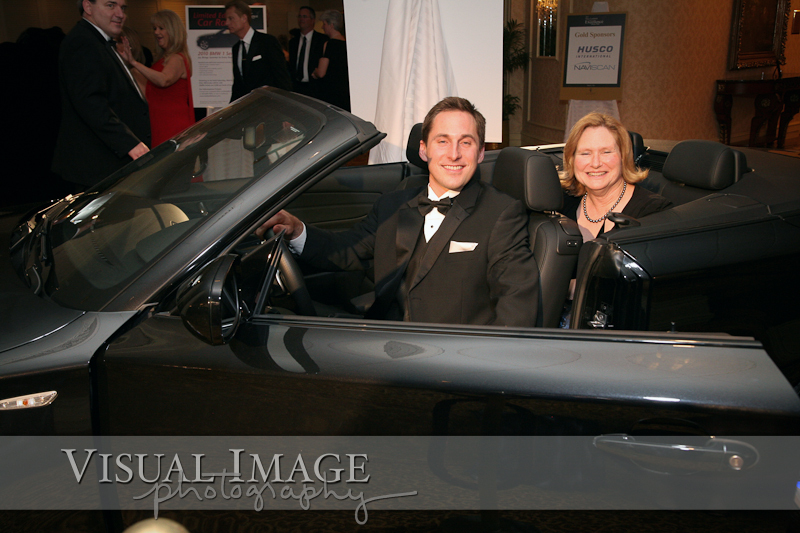 Judy and Mike McGuaran. 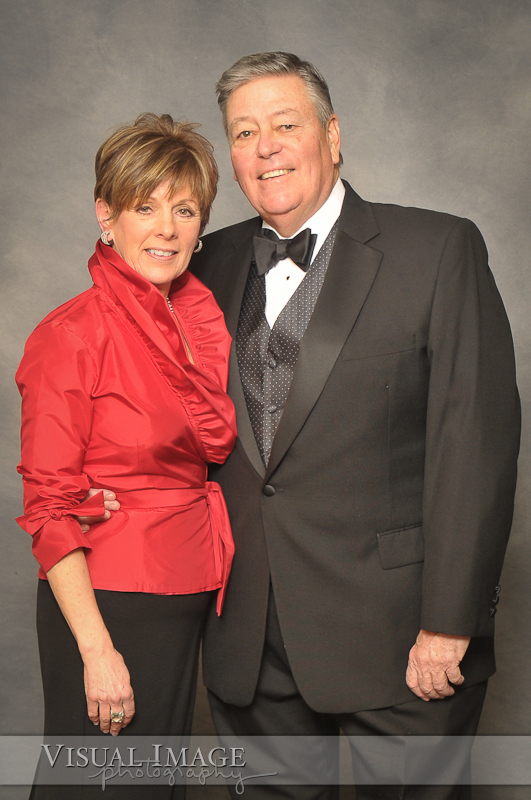 Judy is the Executive Director for the Vince Lombardi Charitable Funds. 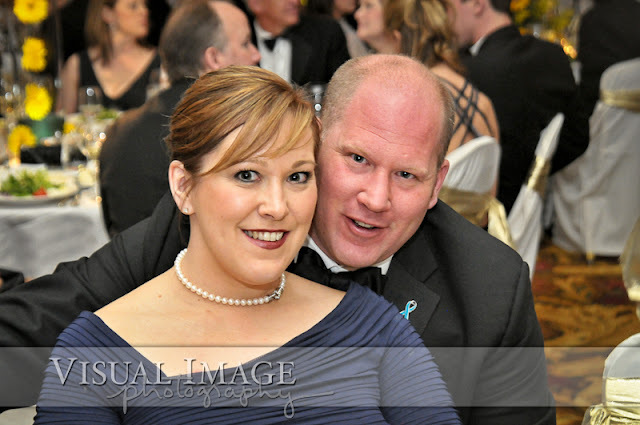 Trace and Katie Tendick. Trace is on the board of directors for the Lombardi Charitable Funds. Charles Woodson signing a football to be auctioned off at the dinner ball. Nick Collins holds an autographed football that traveled with the Green Bay Packers to the Super Bowl. 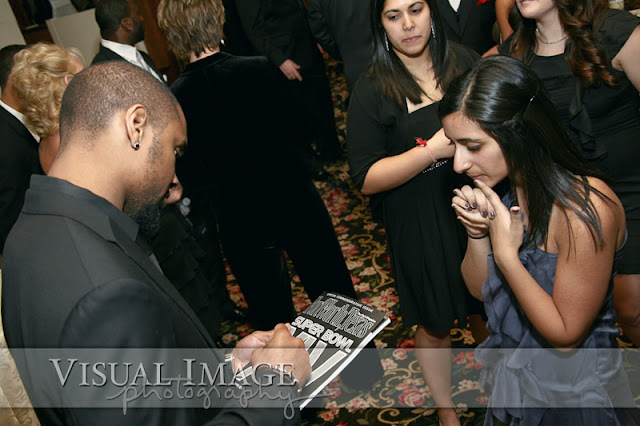 Charles Woodson signs a Super Bowl magazine for one of the guests at the dinner ball. Ryan Grant takes the hand off from Melissa Wise as Dr. Richard Carballo watches the play unfold. Jim Lombardo is the announcer. 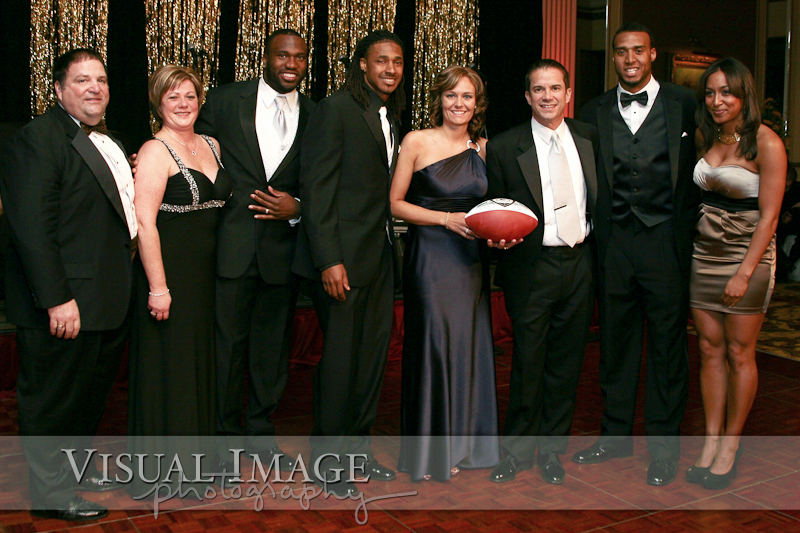 Aldo and Dawn Madrigrano, Nick Collins, Tramon Williams, Melissa Wise and Dr. Richard Carballo, Ryan Grant, and Rita Lewis. Tami and Tom Loper won tickets to next year's Super Bowl at this year's Award of Excellence Dinner Ball. Super Bowl XLVI will be held in Indianapolis on February 5, 2012. 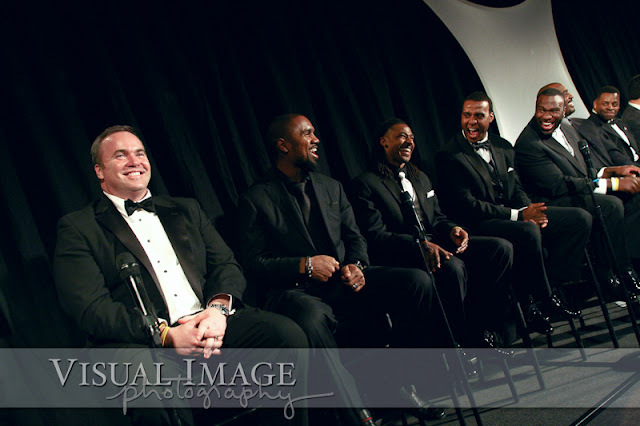 Coach Mike McCarthy enjoys a humorous moment along with some of the players during the Q&A of the honorees at the dinner ball. 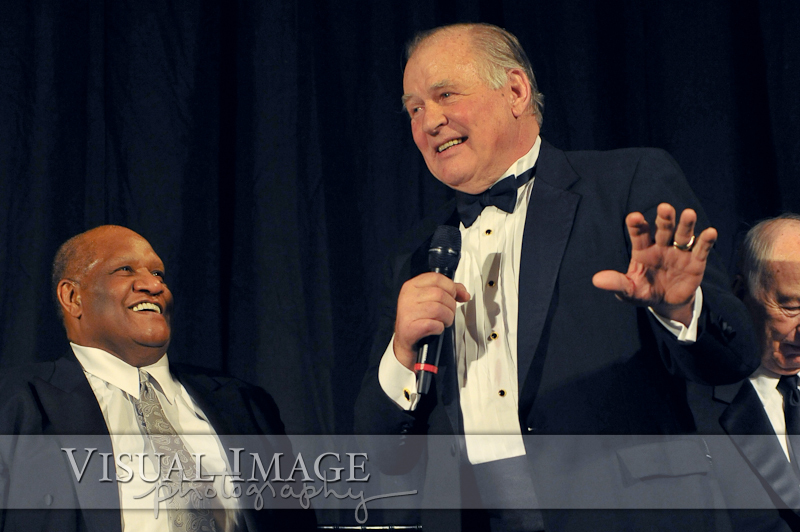 Willie Davis listens as Jerry Kramer answers a question during the Q&A session. 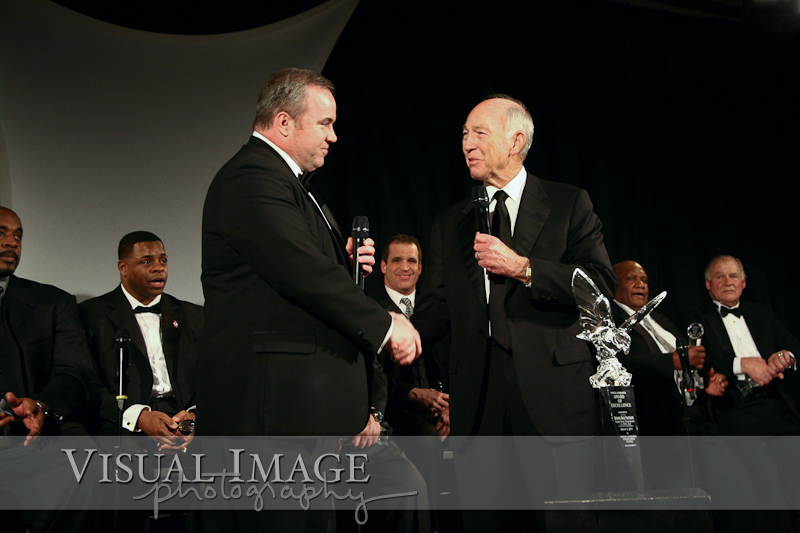 Bart Starr presents the Award of Excellence to Coach Mike McCarthy. Coach Mike McCarthy receiving the Award of Excellence from Bart Starr. Lyn Zigman won the autographed Green Bay Packer helmet signed by the 2011 Award of Excellence honorees. David Kriete enjoys his 2010 BMW 1 Series convertible car that he won in the raffle. Coach Vince Lombardi is known as a maker of champions. His spirit, enthusiasm and commitment to excellence have touched countless lives – on and off the field. Five National Football League championships are not easily forgotten. But more than a coach, Vince Lombardi was a human being who, on September 3, 1970, lost his most victorious battle when he died of colon cancer. 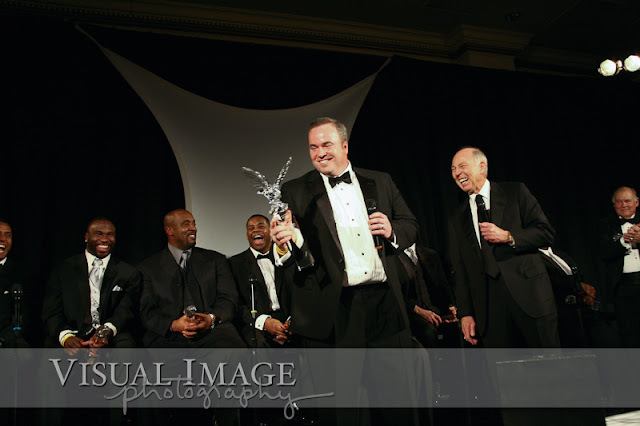 Vince Lombardi Charitable Funds was founded in Coach Lombardi’s memory and proudly hosted the Lombardi Award of Excellence on Saturday, March 5, 2011. Held annually to raise funds for the Vince Lombardi Cancer Clinics, the Dinner Ball recognizes individuals whom have captured the spirit of commitment and pursuit of excellence; standards which define the Lombardi. 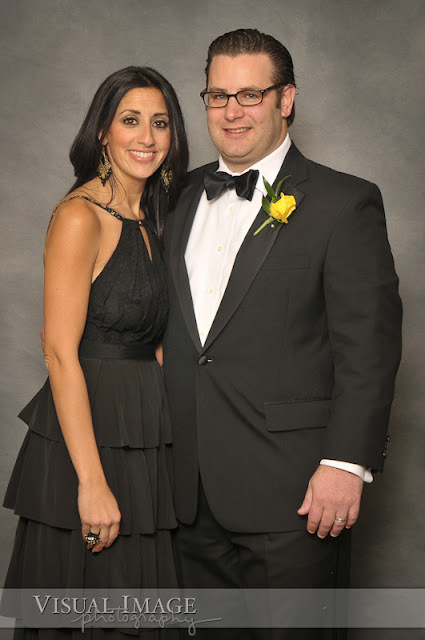 Vince Lombardi Charitable Funds graciously thanks everyone who helped make the 21st annual Lombardi Award of Excellence Dinner Ball an evening to remember!